بخش کشاورزی در ایران از جایگاه و اهمیت خاصی برخوردار است. برای برنامه‌ریزی دقیق در بخش کشاورزی، باید عوامل مؤثر بر رشد این بخش شناخته شوند. یکی از جنبه‌های رشد بخش کشاورزی، رشد تولیدات در این بخش می‌باشد. در این تحقیق تلاش شده تا با رویکردی مناسب، اجزای تشکیل‌دهنده این رشد برای محصولات منتخب استان گلستان که به‌عنوان یکی از قطب‌های مهم کشاورزی و دامپروری کشور محسوب می‌گردد، تجزیه و تحلیل شوند. بدین منظور، با استفاده از رویکردی ناپارامتری به‌نام روش تجزیه تکاثری و بر اساس داده‌های سری زمانی دهه‌های 70 و 80 محصولات کشاورزی استان گلستان، رشد ارزش این محصولات به رشد قیمت، رشد سطح زیرکشت، رشد عملکرد و تغییر در الگوی‌کشت تفکیک شده و تأثیر هر کدام از این عوامل تعیین گردید. نتایج نشان‌داد رشد ارزش محصولات کشاورزی در استان گلستان معادل 16 درصد رشد متوسط سالانه بوده‌است، در حالیکه ارزش محصولات مشابه در کشور رشد متوسط سالانه‌ی 18 درصدی را نشان داد. هر چند ارزش تولید محصولات کشاورزی طی دوره مورد مطالعه رشد مثبتی داشته است، اما عامل اصلی این رشد، افزایش قیمت می‌باشد. پس از این عامل، مهمترین عامل ایجاد رشد مذکور الگوی‌کشت بوده است. در مجموع، این نتایج بیانگر عدم بهبود مناسب در رشد بهره‌وری زمین و نیز الگوی‌کشت منطقه بوده است. The agricultural sector has a special and important place in Iran. In order to make policies and protocols in agricultural sector, it is necessary to better understand the effective factors in growing this sector. In this study, it was attempted to use an appropriate approach to analyze the components of the growth of agricultural products’ value. For this purpose, a non-parametric approach named “multiplicative decomposition method” based on time-series data (1991-92 – 2010-2011) were used to separate value’s growth to parameters such as price growth, cultivation area growth, yield growth and changing cropping pattern and determine the effect of each parameter. The results showed that the growth of agricultural products’ value has had the average annual growth of 16 percent, while the value of the same products in the country showed the average annual growth of 18 percent. Although, the value of agricultural products during the study showed a positive growth, price growth and then cropping pattern were the main reasons for this growth. In sum, these results represent lack of an appropriate improvement in land productivity growth and cropping pattern in Golestan province. سلامی، ح. و اشراقی، ف. 1380. تأثیر سیاست‌های حمایت قیمتی بر روند رشد تولیدات کشاورزی در ایران تحلیلی با استفاده از روش تجزیه تکاثری. فصلنامه اقتصاد کشاورزی و توسعه، 36: 21-7. پرتال سازمان تحقیقات کشاورزی و منابع‌طبیعی استان گلستان. 1393. قابل دستیابی در: http://www.ganrrc.org.ir، آخرین دسترسی: 1/8/1392. Ahmadi shadmehri, M.T. 2008. Estimating growth rates and decomposition analysis of agricultural production in Iran (1970-2000). Trends in Agriculture Economics, 1: 14-26. Jamal, H. and Zaman, A. 1992. Decomposition of growth trend in agriculture: Another approach. Indian Journal of Agricultural Economics, 4: 644-652. Mahir, M. E. A. E. and Abdelaziz, H. 2010. Estimation of growth rates and analysis of its components in the Gezira scheme. Research Journal of Agriculture and Biological Sciences, 6: 885-890. Rehman, F. U., Saeed, I. and Salam, A. 2011. Estimating growth rates and decomposition analysis of agriculture production in Pakistan: pre and post SAP analysis. 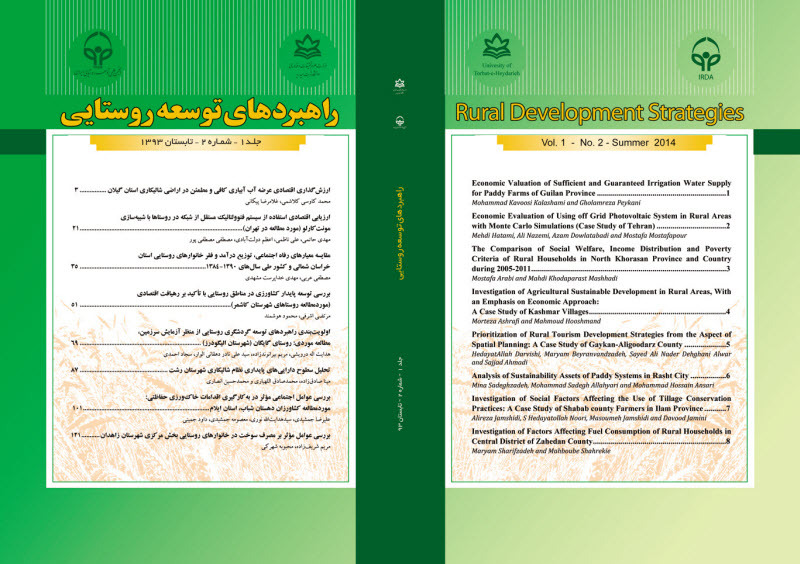 Sarhad Journal Agricultural, 1: 125-131.